Hey Rock n' Roll Fans, couple of administrative points first. You may have noticed a drop off in the pace of reviews. My apologies...but January/February is when I hunker down and assemble my best of the previous year mixes...and much of my attention as of late has been focused there. In preparation for the St. Patty's Day unveiling of my Best of 2010 mixes, I've also been scrambling to get up posts for all my previous year collections since I started building them in 2004. In addition to the 2009 collection, I now also have the smaller 2004 and 2005 collections up, which you can access at your leisure by selecting the FAVORITE SONGS AND ANNUAL MIX COLLECTIONS list on the page menu just to your right. 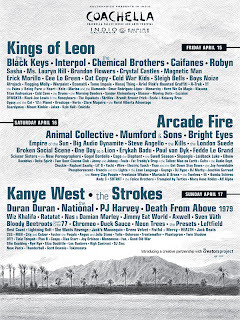 Secondly, I hope to have a decent review of the 2011 Coachella line up out soon, but can say my initial impressions were so-so. Fest line-up doesn't seem to have as clear an identity to me this year, feels off balance (2011's Friday's undercard is insanely overstuffed, Sunday's is the weakest I have ever seen), and I'm personally one who feels any year Goldenvoice fails to get a couple of the still active big time representatives of the 60s and 70s on the bill is a serious lost opportunity with time running so short for most of those artists (was really hoping for Stones/Neil Young). It still kills me that they failed to bring in Love before Arthur Lee passed away. Despite all this, I've learned through my years of attending that the lineup on paper never ends up in sync with the quality of the experience one has...anticipated acts disappoint, unknown acts blow you away, and there are just tons of intangibles at play. 2008's poster was by far the least impressive when first released, but because so many of the acts I did see crushed their sets, it remains head and shoulders the best year I have ever attended. If I were to make one prediction, it's that Sunday night, with my guess of Duran Duran at 6ish on mainstage, leading into the National at sunset at the Outdoor, then into PJ Harvey, Strokes, and Kanye West in succession to close the mainstage, will prove to be the festival's most celebrated stretch of music after all is said and done. Sigh No More - Mumford & Sons: Energetic, very mainstream feeling folk. The Cave and Little Lion Man are fun tracks, but rest felt rather generic on first listen. Astro Coast - Surfer Blood: Very disappointed with this, for a punk-pop release that's focused on hooks, these hooks have no bite...oh the irony for an album with a great white shark on it's cover. I'm sure I'll come to like it touch better with repeated listens, but if I had to go off my initial impression this is a not recommended at present. Fast Jabroni only cut on this album truly doing it for me right now. The Drums - More eighties vein than Astro Coast but oddly similar in some way, like it much better...this feels like it will end up being a low ranking solid or high ranking mild recommend. Sometimes The Blues Is A Passing Bird (EP) - The Tallest Man On Earth: Five more tracks from the fabulous solo artist, who most like to compare to pre-electric Dylan. Don't get it before you grab his 2010 full length The Wild Hunt, but a solid addition for big time fans. Becoming A Jackal - Villagers: Brit pop and trad folk intersect in this Irish artists release. Liked this one quite a bit on first pass, and loved the little throwaway The Pact (I'll Be You're Fever). Forget - Twin Shadow: Some are calling this newcomer the "black Morrissey" and that description feels pretty apt. Didn't like this one as much as I though I would based on reviews...not as dynamic as I had hoped, but a couple of tracks cut through strong. My Father Will Guide Me Up A Rope To The Sky - Swans: A comeback album of sorts, first Swans release in eleven years. Will be far too "industrial," dark, and experimental for many, but I was all over this one on first listen. Can see this ending up as worse than a very high ranking solid for 2010, and quite possibly a strong recommend. Public Strain - Women: Another prickly, atonal album that will be very difficult for many, but that I was totally digging. Very primitive no-fi, almost early Velvet Undergroundish at times, unique...unlike anything else out there right now on the no-fi side of the spectrum. Strange Weather, Isn't It - !!! : Not as immediately accessible as Myth Takes, but found myself enjoying it almost as much...opening two and closing two tracks make very strong bookends...sags a bit in the middle. As St. Patty's day approaches, I change up my listening strategy to power through any outstanding releases I intend to consider for my annual mix collection, so I got in a ton of first listens on some 2010 releases over last two days. Here are my unvarnished, and most likely subject to drastic change, first impressions. Love, love, love this girl Cameron Mesirow's voice. It's stunning from the album's opening note. Reminiscent of Bat For Lashes' Two Suns. Not as accomplished, but still sense there are some tracks here, especially Apply and Home, that I am going to love. Meh...Grungy no-fi punk out of UK, but definitely following lead of American acts like No Age. Too muddy to pick out any detail on first pass, though Weird Feelings and T.U.F.F. struck me as promising. Otherwise, not to optimistic on this one...I'm just not a fan of the most no-fi of these no-fi releases. Comprehensive compilation for a little know, gone-in-a-flash 90s act that was one of only stateside contempories of My Bloody Valentine, Orchids, and all those other early UK shoegaze acts. Some nice tunes here, including four new tracks recorded specifically for this retrospective, but doubt it will appeal to many beyond ardent C86ers. Surprise! Found myself really enjoying this one. Still think Dean Spunt has the worst voice of any singer in any contemporary band of note, but this album is more accessible, and less no-fi, than Nouns or Weirdo Rippers...band's starting to feel a bit Ramonesy, which is never a bad thing. Can't wait to give this one another go. Very brief, seven track release from female folkie/singer-songwriter. Didn't seem as out-of-the-box original as some early reviews led me to anticipate, but definitely has some nice tracks. Save Yourself and Don't Do It, in particular, made strong first impressions. Think this will prove to be quite solid with repeated listens. Didn't get this one at all. Is it punk? Is it pop? Is Fang Island a primarily instrumental Styx/Kansas tribute band? Felt very cheesy and insubstantial on first pass, but it's definitely different...gonna take time to make sense of this release. Pretty sure I'm going to end up loving this one, Superchunk's first proper release in over a decade. Fantastic power-pop with a touch of that 90s hard-edge. Track Crossed Wires stood out, but found myself digging whole thing. Could easily see it ending up as my favorite power pop release of 2010. Took in a first pass of Bruce Springsteen's The Promise yesterday. Enjoyed it immensely, though my strongest overall impression is that he made very good choices thirty-three years ago, because not one track here screams out as better than anything that did make it onto Darkness On The Edge Of Town. I'm sure Boss fans will love it, but be careful, critics are really overpraising it, swayed in large part, I assume, by it's historical cache...from a purely musical standpoint, it's a delightful, solid listen, nothing more, and not quite as strong as the contemporary but very similar feeling The Suburbs by Arcade Fire. Again though, just my first impression, which has been known to change dramatically with repeated listens. Also worked through another pass on Eluvium's Similes...not enjoying it as much as I did '07s Copia, but have to say album closer Cease To Know is a stunner. A song couldn't be more aptly named...a very static, but gorgeous, eleven minute ambient groove, the song seems able to to stop time and force me into a mind-emptying, peaceful state every time I hear it. At this point, I'm almost certain it will end up closing my best of 2010 electronic/experimental mix coming on St. Patty's Day 2011. Finally, halfway through another pass on Erykah Badu's New Amerykah Part Two. Can't say I'm digging this one too much, but then, outside of Sly and Family Stone's There's A Riot Goin' On...have never been a big fan of soul music done in this kinda loose, amorphous, sometimes almost grooveless style. Just feels like there's nothing instrumentally concrete to hang onto. On the Coachella watch. not looking good for the Stones. In their place, Kanye West and Neil Young seem to suddenly be getting a lot of buzz...have never seen Neil, so would love that, and how do you not go for Kanye after the mega-smash he just dropped with My Beautiful Dark Twisted Fantasy (which I could see being considered the second greatest rap album of all time after Nation of Millions a few years down the line if it ages well), but still, will definitely shed a tear if Stones not headlining that Coachella mainstage, the best sounding venue on the planet, for one of 2011's three nights. Got my first listen to John Grant's Queen of Denmark this morning and found myself pleasantly surprised. The album didn't make many year-end lists, but I can see how it did rank quite high on the few that it did. Backed throughout by Midlake, it's got a homey 70s soft-rock sound with a rich orchestration on some numbers, and reminds me of Ringo Starr's solo debut, of all things, with it's easy going nature and very funny, unforced self-deprecation. Definitely worth checking out if it sounds like it's in your wheelhouse. And onto another subject near and dear to my heart, sounds like we could have the 2011 Coachella lineup out within the week. Will probably end up dragging out another couple weeks, but either way, can't wait, and have my fingers strongly crossed that when it is revealed The Rolling Stones will be topping the Marquee. Speculation at moment points to Daft Punk, Arcade Fire, Beastie Boys, REM, Neil Young as other most likely headliners and sub-headliners.